The Crossfire Minute: Keep the Gift! 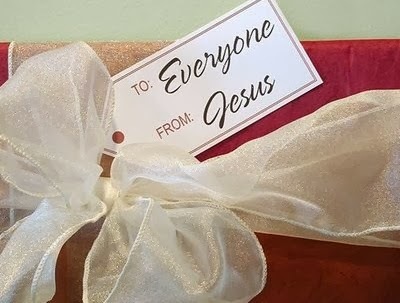 In my last post I encouraged you to completely unwrap and embrace The Father’s gift of grace; imputed righteousness, power, knowledge, readiness, and insight into the Father’s heart of grace. Assuming you have opened, unwrapped and embraced the free gift of grace by faith in Jesus, you have all the enrichment spoken of in 1 Cor. 1:4-9. Many believers receive the gift grace and open it, but as time goes by begin to fall into old patterns of belief and behavior. They begin to forget the value and full dimension of God’s gift of grace. They begin to fall away from grace and enter into works; often subtly and slowly. Why? Because most people and our world systems do not reinforce the concept of unmerited favor, blessing, power, righteousness, and insight. Therefore, so many believers are drawn backward rather than being led forward by the Spirit. Paul told us that if we are led by the Spirit, we are ‘not under the law’ (Gal. 5:18). It’s a lot like what we Americans do after Christmas. We have opened our gifts and finished the celebration. Then we decide to return the gift. We decide one particular gift is not quite right for us. So, we go to a merchant and either get a refund or exchange it for something else. We don’t keep it! We return it! That is exactly what Paul warned the Galatian believers about. They initially received and believed the good news of grace with great joy. Then others influenced them to return to certain aspects of the Law of Moses, such as circumcision, to prove they were righteous. He said ‘I am astonished that you are so quickly deserting the one who called you by the grace of Christ and are turning to a different gospel’ (Gal. 1:6). They were returning the gift...exchanging grace for works. They were giving up grace and going back to works to be justified and righteous in the eyes of God. Paul said they had ‘fallen away from grace’ (Gal. 5:4). Wow! This Christmas season hold firmly to the gift of grace. Don’t let go of it! Don’t get a refund. Having unwrapped it, opened it, and enjoyed the enrichment of it, continue in that gift. Keep it! It has the power to keep you! So, you may exchange some of those other material gifts you received at Christmas, but not the gift of grace. Cherish it. Live it. As Paul spoke of grace, he also speaks to you saying, "in every respect you were enriched, in full power and readiness of speech (to speak of your faith), and complete knowledge and illumination (to give you full insight into its meaning)." ~ 1 Cor. 1:5.